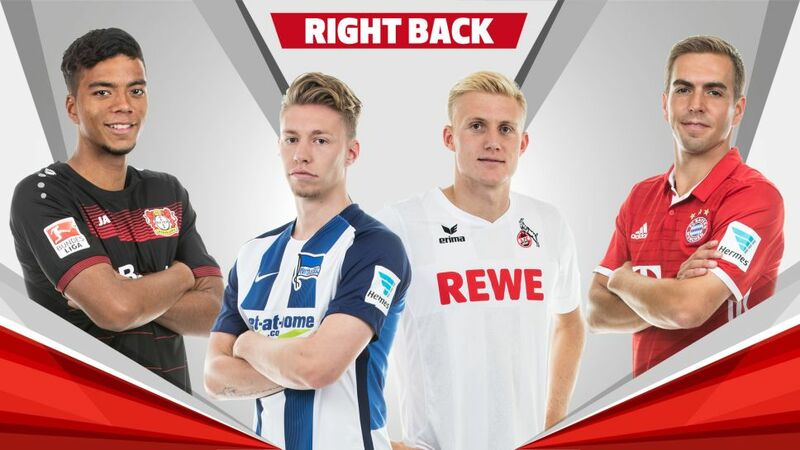 It's time to pick your 2016/17 Bundesliga Team of the Hinrunde, and here is your selection of right-backs to choose from. A model of consistency as Bayern have retained their top spot, Lahm has - remarkably - completed almost 90 per cent of his passes this season. Used both at right-back and in midfield by Carlo Ancelotti, Lahm may be enjoying fewer on-pitch minutes, but seems to be becoming more effective with age: the 33-year-old has already picked up a goal and an assist this term. Weiser has enjoyed an outstanding first half of the season as Hertha Berlin have ensconced themselves firmly in the UEFA Champions League-chasing pack. The Cologne native has created four goals for his team-mates, as well as scoring one himself, despite missing three games with injury. The 22-year-old is another fine source of Official Fantasy Bundesliga points. One of the surprise packages of the season, Henrichs has been irreplaceable at full-back as Leverkusen have progressed to the last 16 of the Champions League and close in on the European spots. The 19-year-old has started all but one of Die Werkself’s first 14 games of the season and earned a spot in Joachim Löw’s recent Germany squad. That Köln boast one of the Bundesliga’s best defences is in no small part down to the Denmark-born, Italy-schooled centre-back, whose effortless switch to full-back has belied his 24 years of age. Sörensen has featured in every minute of the Billy-Goats’ impressive campaign thus far, chipping in with an assist along the way.